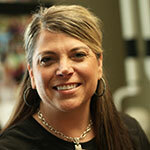 Gerri joined our practice in 2009. She is an EFDA and assistant to Dr. Jerry. Gerri has many special qualities which her patients love about her. She has a way of making dentistry fun. She has two beautiful girls who she idolizes.